This one ONLY works with gasoline car.It could NOT work with diesel car. It may work on C3 and C4,but we are not sure whether it works on C1/C2 or not. We suggest you to order 1pcs sample to test. It is a cheap obd2 scanner but it is powerful,if you go to local dealer or repair shop,I believe it will cost more. You can NOT miss it . This is V1.5 version bluetooth elm327 and it is PICI8F25K80 Chip. It supports MORE cars and mcuh better quality than V2.1 elm 327. If your V2.1 elm 327 can not read your car ECU,so you need to order V1.5 version elm 327 to try,but it does NOT mean it 100% work on your car as we can not test each car.The truth is that with 25K80 chip V1.5 version elm 327 supports MORE cars! 1.This is an vehicle diagnostic tool interface scanner, which is is used to read trouble codes,clear trouble codes and detect fuel pressure and so on. 2.OBD-II Software for ELM327 is a free program that allows you to use your PC and a hardware interface to get theinformation from your car's computer. 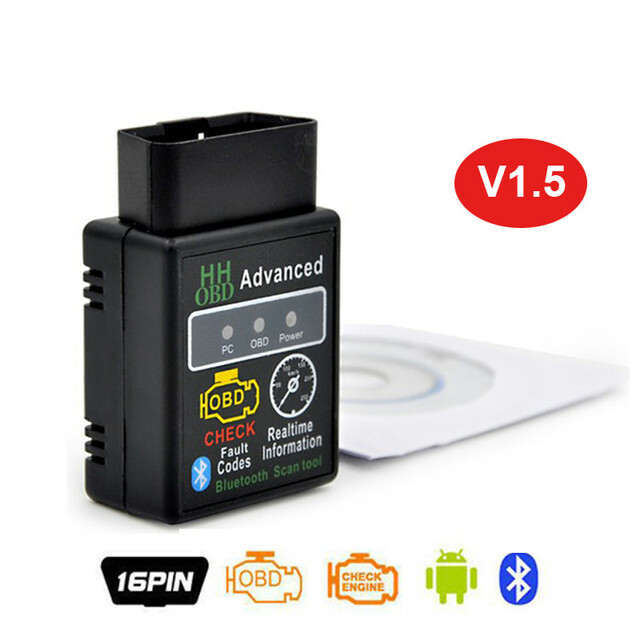 HH OBD bluetooth ELM327 is the newly developed wireless scan tool.